Microspheres are often used as handles for protein purification or force spectroscopy. For example, optical tweezers apply forces on trapped particles to which motor proteins are attached. However, even though many attachment strategies exist, procedures are often limited to a particular biomolecule and prone to non-specific protein or surface attachment. Such interactions may lead to loss of protein functionality or microsphere clustering. Here, we describe a versatile coupling procedure for GFP-tagged proteins via a polyethylene glycol linker preserving the functionality of the coupled proteins. The procedure combines well-established protocols, is highly reproducible, reliable, and can be used for a large variety of proteins. The coupling is efficient and can be tuned to the desired microsphere-to-protein ratio. Moreover, microspheres hardly cluster or adhere to surfaces. 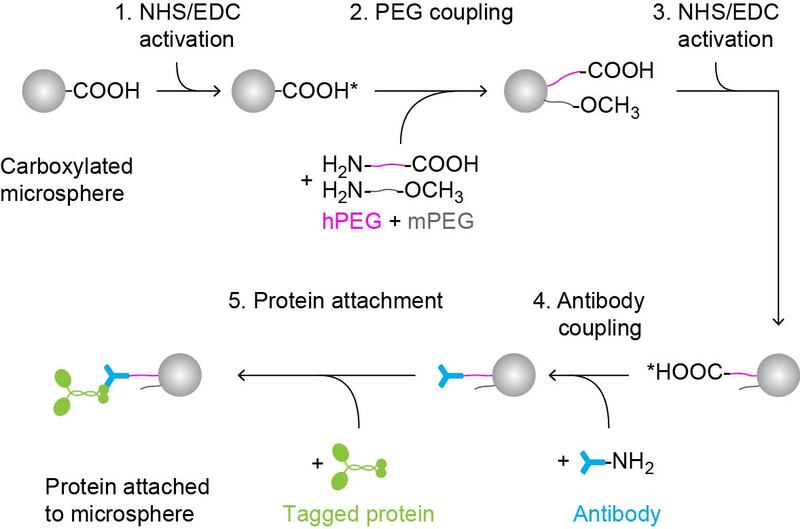 Furthermore, the procedure can be adapted to different tags providing flexibility and a promising attachment strategy for any tagged protein.